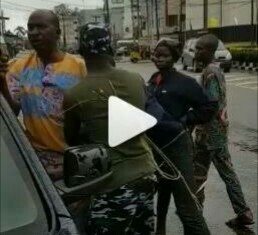 A Mobile Policeman was, on Saturday, arrested for raising his hands against a pregnant roadside food vendor in Lagos. According to reports, the incident happened around Toyin roundabout, Opebi. The mopol was said to have approached the lady to buy N50 yam and N100 beans. Trouble started when he was told that to get 3 pieces of yam, he has to pay N60. In the cause of the resulting argument, he descended on the lady. The attention of some policemen was later drawn to the incident and they promptly apprehended the erring officer who was severely dealt with. He was then taken to the station.